A dog doesn’t take itself for a walk. It needs the owner to assign a time, grab the leash and open the door. A goldfish can’t swim outside of the confines of its small bowl. A caged canary can’t fly to the sky above. And a circus elephant does its tricks on command. We shouldn’t need to be told when to take action, when to utilise our unique skills or when to make a positive difference in the world around us. We’re not wearing a leash or stuck in a physical cage. 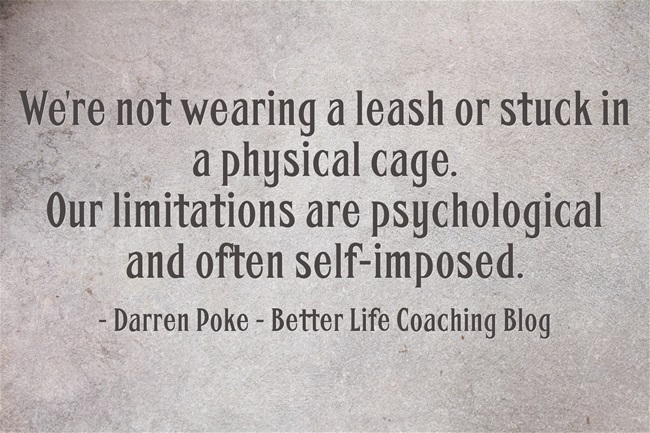 Our limitations are psychological and often self-imposed. Our fears, our anxieties, the restrictions that we place on our capabilities are often based more on our perceptions than reality. Remove the shackles that bind you. Make big goals and take purposeful action. Stop inventing excuses for not doing what you’re meant to be doing. Don’t wait to be chosen, choose yourself. Live with freedom, meaning and creativity.